Major utility E.On has urged the UK government to encourage homeowners to take up solar PV and batteries in the midst of growing policy uncertainty. The company, which last year announced a major domestic solar-plus-storage drive in the UK, has made the call a week after the government announced plans to scrap the export tariff as part of a much wider review of policy support. Much of the industry is currently considering its response prior to two consultation deadlines in late August and early September, but E.On has come out swinging in solar’s corner. Sara Vaughan, E.On’s political and regulatory affairs director, said there is “so much more left to do across the country” if it is to meet the government’s Clean Growth Strategy ambitions and highlighted solar as an “efficient way” for homes and businesses to contribute. “We believe the government needs to develop a new framework to encourage domestic solar, based around the concept of a Green Mortgage that can help customers spread the upfront costs, as well as tax incentives such as reduced stamp duty, which create additional value for homes that have invested in solutions to deliver a higher energy performance. 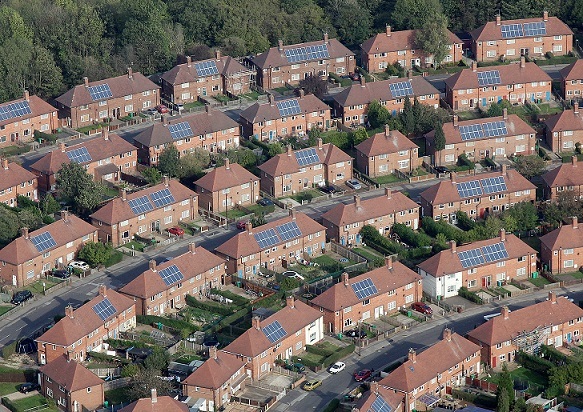 “In addition, we support calls to exclude solar from business rates, to cut VAT on domestic battery installations so homeowners can use the maximum amount of the energy generated by their solar panels, and also use the forthcoming housing review to ensure solar becomes standard on new homes and can be included in re-roofing projects," Vaughan said. Green mortgages and tax incentives have been mooted by the industry as potential ways to incentivise small-scale renewables uptake without impacting on consumer bills, but they have not been explicitly mentioned by the government in any of its proposals to date. Business rates and the way VAT is structured for domestic batteries have long been battle lines for the Solar Trade Association. “Addressing these issues is an urgent priority to ensure customers have a clear picture of the benefits and payback periods to reward the investment they make or have made in solar technology,” Vaughan added. The consultation on the future of the export tariff closes on 13 September 2018.